When I moved to Miami my daughter was about 15 months old and my olest 3. We didn't know anyone and had to quickly find solutions for daycare. We were still getting to know neighbors and couldn't trust anyone with our treasure. One day for some reason (mommy brain...don't remember) I had to bring my daughter into work with me. I was working at a university and had my own office. So I figured I could close the door and I wouldn't bother my co-workers. What I couldn't predict is how my boss would respond. He had always been great about me working from home when I needed to but bringing a toddler to work? I got to the office early and he was not in yet. I had time to get her settled, start work and answer some emails. When he arrived he was definitley surprised to see her. I explained why I had to bring her in (still don't remember) and said I would keep her in the office with me. No one would hear a peep from her. His response was brief but he seemed ok with it. I knew I was pushing it by bringing her in but in my mind at that time I wanted them to know I was committed to my work. And committed to my children. Besides he hired me before I moved to Miami so he knew our childcare situation was dismal. That day, I did get a comment from one of my co-workers about the office now being a day care. I nervously smiled and laughed it off but that was my sign my co-workers had been talking about it. I felt embarressed and questioned if I should have brought her...but I had to. Needless to say it was the only and last time I did. My boss obliged a re-occurring work at home schedule for me after that. So a few days a week I could be home with my kids and get my work done. Bringing my daughter to work was not an easy choice for me. But I was in between a rock and a hard place and had to make a move. Thankfully it didn't blow up in my face. I was grateful for the results. Not every woman gets either of these choices. Unfortunately many companies do not accomodate employees this way, male or female. Should they? Recently, an article was written by a mom with a similar situation. Hers ended differently. Her baby quickly became the "office baby" but after 4 months she had to acquire day care out of the office. This article referenced an organization called Parenting in the Workplace Institute. They find resources for the implementation of formal programs in which parents can bring their children to work every day and care for them while doing their jobs. 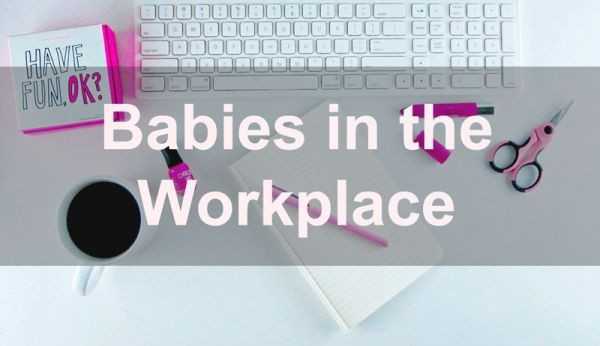 According to their research allowing children at work increases employee retention, booses morale of employees, increased efficiency from employees who were parents and parents were able to return to work sooner after childbirth. They also provide tools for employees to use so they may advocate for their child in the worklplace. What an amazing idea! But does this minimize quality time with the baby and put a blinder on longer maternity/paternity leave? For the mean time, I would like to consider this a positive for working moms (and dads) with little to no options.